Ruth has been such a kind, patient and supportive instructor to me over the past year. When I started to learn I never thought I would have the ability to become the confident and independent driver that I wanted to be, but Ruth has helped me so much to improve on these things. Using the LDC workbook was especially helpful for revising before and after lessons, recording my progress and noting down what I needed to work on or study more of. 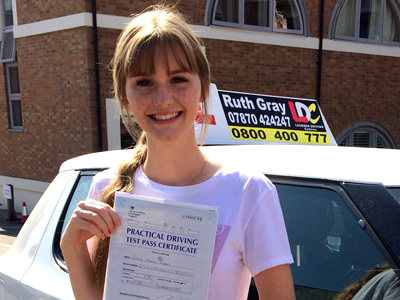 I can’t recommend Ruth highly enough - learning to drive has been so enjoyable with her. Thank you so much Ruth! I found the system to be incredibly beneficial to my leaning and I was very happy with my friendly instructor who allowed me to progress at my own pace. 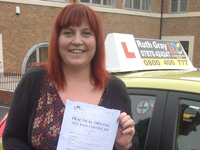 Ruth was the best driving instructor that I could have asked for! She is extremely professional while being calm and friendly which was really important for me. When I started learning I was very unsure and under confident but Ruth quickly changed that and now I feel confident being on the road! I passed first time and if this isn't proof enough of how good she is I don't know what is! I can't recommend her enough and she was brilliant from day one! Thankyou so much Ruth! 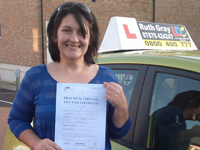 We have really enjoyed having Ruth as a driving instructor. She is very professional and she was able to offer us intensive lessons over a month. The course was well structured with the use of the DVD and workbook, and we feel that she has taught us to be safe and confident drivers. 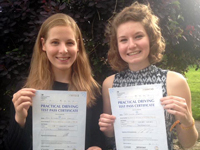 We are very competitive so it was a good job we both passed first time on the same day! Learning with Ruth was great as she was always so calm and understanding with me. I would highly recommend her to anyone who wants to learn to drive, she made me feel like a happy, confident and safe driver. Ruth was always patient with me even when I didn't always understand, I cannot thank her enough for what she has done for me. I started learning to drive at the beginning of last year, despite the fact that it has taken me just over a year to pass only reflects on my ability to learn, not Ruth’s ability to teach. The LDC system allows you to revise before and after your lesson, plan out your lesson and watch certain lessons before trying them out yourself. I think that if I hadn’t gone with this system I would still only be half way through my course because being able to look back to revise helped me massively. Ruth’s patience was exactly what I needed to get through till my test as I had expected to pass within only a few months as a lot of my peers had, so, if anyone is struggling to find the motivation to keep it up, find Ruth and you will get there in no time. I am very thankful for my lessons and the time that has gone into them and I will never forget the massive help and positivity I received. Thank you Ruth. I was very impressed with how Ruth taught me to drive. She was always a calming influence and she explained everything very well. I found that she was always reliable and booking lessons was done with ease. I would recommend Ruth as a good instructor. 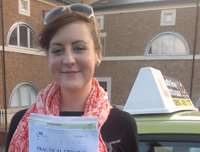 When I first started learning to drive I remember having a great disbelief in thinking that this was something I could achieve, but through having Ruth as an instructor and by following the brilliantly structured LDC programme I was able to both succeed and be confident with this invaluable life skill. 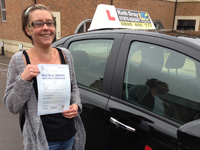 Ruth is a very thorough instructor which I found to be a vital and very beneficial quality as everything she taught me stayed with me and gave me the confidence I needed with my driving capabilities and awareness. Ruth's method of teaching also crucially helps to identify your strengths and weaknesses, and by doing this every lesson you can expect to see progress quickly and reach the ultimate goal of passing your test. 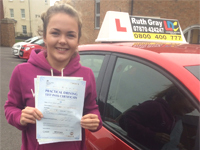 Feeling capable and confident is how I think every learner should feel before taking their test and Ruth made sure that this was how I felt before I took mine, which I believe is the reason I passed first time! Furthermore the LDC workbook and DVD pair up well with the lessons to help break things down at a pace you can tailor to your type and speed of learning. These resources provide hours of tuition which you can keep referring back to in your own time and that make this programme one of the best out there! So in summary - Thank you Ruth and thank you LDC! I cannot recommend Ruth highly enough. The lessons were tailored around my learning style and each session was clearly structured with goals identified at the beginning. Ruth was always patient, friendly and professional- thank you so much Ruth! 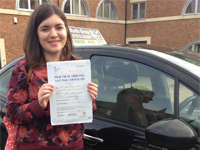 I passed first time with Ruth, she was lovely, patient and a very good teacher. I would highly recommend Ruth, and members of my family will be using Ruth in the future. Thanks so much Ruth. Learning to drive through Ruth Gray and LDC was proberly the best decision of my life, The LDC work book and DVD help to break everything down into easy and manageable sections which help to grab an theory understanding, before you try the practical side. I would have never past though if it wasn't for Ruth Gray, she is absolutly brilliant, from the 1st day till the last, she was very patient to me, and would always take time to explain in full detail if there was something that I wasn't quite grasping and understanding. The way I look at my experience with learing to drive through LDC and espically Ruth is that I started with an instructor teaching me to drive, and past my driving test while gaining a brilliant friend. 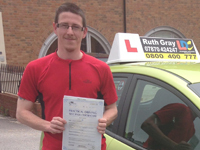 With a combination of the workbook, the DVD & Ruth, learning to drive was such an enjoyable experience. The lessons were clear and structured well to gain the most out of the time that we were in the car. Ruth is easy to get along with and such a friendly instructor who was flexible to accommodate my lessons & courteous during my lessons. She was patient with me when i couldn't get the hang of things at the start and always believed in me when I doubted myself. Ruth is a really great instructor! The day I passed my practical driving test I couldn't stop grinnng. Learning to drive has been one of the hardest things I have ever done. The only way to pass is to actually be able to drive, no way to cheat or talk your way around it. 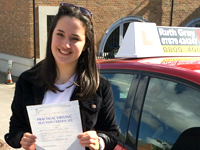 Ruth enabled me to learn to drive and pass the practical test combined with the excellent LDC materials, DVDs and Manual. She is the most patient person I have ever met. Ruth recognised how I am a very literal person and geared her teaching to meet my needs. I can't thank her enough. Plus I hope I've gained a good friend alongside my driving licence:). Having had lessons with other instructors before, I decided to book an LDC semi intensive course with Ruth as I had read good things on her website. I'm glad I chose her as my instructor as she understood that everyone learns at different paces and in different ways and didn't rush me into anything I wasn't ready for, and as a result I learnt better. I never would have thought I would pass my test first time but thanks to Ruth I'm proud to say I did and feel safe on the roads thanks to her teaching. There is nothing to describe the feeling you get when you achieve something that you never thought that you would be able to do. It changes the way that you look at yourself, makes you wonder just what else you could do. I had all but given up on the idea of driving, had no confidence in my ability to control a car. But the moment came when a change in my life demanded that I be able to do so. I asked around and got a great deal of suggestions for an instructor, but nothing seemed right. It was when a friend (another mature learner) told me about Ruth�s patience, kindness and inspiration in helping her pass the test, that something clicked. It was one of the best decisions that I have ever made in my life!! There were good days and bad, but throughout it all Ruth believed in me with her whole heart and soul. Whenever I wanted to give up, she never let me walk away. In addition, the LDC materials were clear and easy to follow, helping build my knowledge in a logical and well ordered way. 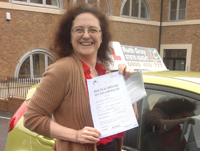 On the 21st December, 2011 I passed my test, and once what I thought impossible became gloriously possible. I cannot recommend Ruth highly enough! Truly, if she can teach me how to drive, she REALLY can teach anyone!! LDC was the right choice for me. I booked an intensive course and with the workbook and DVD it meant I could study prior to the lesson and ask any questions whilst on it. My instructor was fantastic, she was informative, encouraging and endlessly patient. 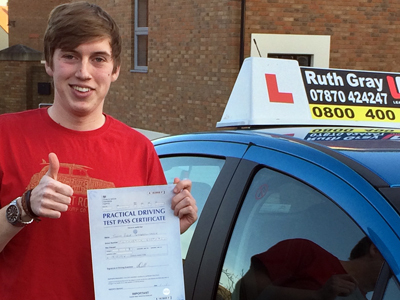 Ruth gave me the confidence and skills to learn to drive and I was rewarded by passing my test first time! A testimony to the training I had received. Thank you LDC and you too Ruth! I really enjoyed learning to drive with Ruth. 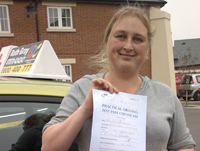 The lesson structure was really helpful and i was given other resources backing up what I had learnt, driving didn't come easy to me but Ruth was very patient with me and I passed my test first time round! Thanks so much for teaching me Ruth, I would recommend you to anyone! I cannot recommend Ruth highly enough! 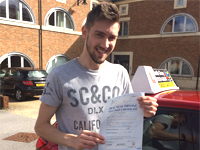 I passed 1st time thanks to Ruth at LDC. I never thought I would pass but Ruth gave me the confidence to carry on. 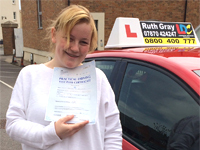 Ruth was very patient, pleasant and understanding and would recommend Ruth to anyone who wants to learn to drive. The LDC workbook and DVD do help at home, as you can have a general idea and understanding what you'll be doing for your next lesson. 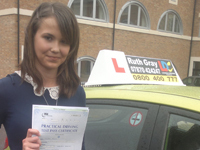 I love to drive and Ruth has turned me from a nervous driver to a confident one. Thank you Ruth for all your help.